Whether you are beginning your first year of homeschooling or your fifth, getting started and staying motivated can be difficult. Sometimes we are not realistic in our expectations and begin the year with too many plans in place. We may sign our kids up for lots of extracurricular activities without realizing the time or mental commitment involved. We may overplan the school day, filling every minute with school work, and become stressed when everything does not get finished. What happens then? We abandon our plans until we start to feel like we’re not doing enough. Then we overplan again and the cycle continues. Or, sometimes we begin the year without adequate planning. Instead of planning too much, we don’t plan enough or make a plan at all. As time goes on, we notice that not much is getting accomplished and we feel like we need to do more to make up for it. So, what do we do? We plan too much and then get stressed when it doesn’t work out. So, how do you get started and stay motivated? I think the answer is balance. Every family is unique and you need to find the right balance for your family. Be realistic in your expectations. 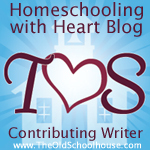 If this is your first year of homeschooling, you many not know what to expect. It may take some time to figure out how much work is too much and how much is too little. Observation is key. How long can your child stay focused on an activity before losing interest? Does your child perform better with breaks between subjects? Taking breaks has never worked well in our family. Once I lose my kids’ attention, it is difficult for everyone to refocus and get started again. However, some families take breaks throughout the day and find that it works well. Are extracurricular activities a help or a hindrance to your day? This may take some time to figure out. Even if this is not your first year of homeschooling, continue to observe your children to find a balance that works. What worked last year may not necessarily work for your family again this year. Also, as your children grow they will be able to do more. A workbook page that was sufficient last year may be too easy this year or just too boring. Conversely, just because your child advanced a grade, that doesn’t mean he or she can necessarily complete the assignments in a book that is supposedly appropriate for that grade level. Every child is different and learns at his or her own pace. Don’t frustrate your child with someone else’s expectations. Continue to challenge your kids and observe how they respond. Are they frustrated or excited? It is alright to adjust your plans as you go. That is one of the beauties of homeschooling. If your kids are excited by a challenge, then continue to challenge them. If they are frustrated, then lower the difficulty or just put it on hold and try it again later in the year. Staying motivated will be easy once you find the balance that works well for your family. Avoid extreme behavior at all costs. Just because it feels like something is not working, that doesn’t mean your plans have failed and you should throw in the towel. Do not give up! Adjust your plans a little and try again. Don’t be afraid to make an adjustment. Sometimes the smallest change can make a world of difference.